Philadelphia (CNN) – The seated statue of Benjamin Franklin towered over Mitt Romney in the marbled rotunda but the White House hopeful stood tall as he reflected on becoming the Republican presidential nominee. “Yeah there are challenges and there are days that you get beat up in the newspaper and you don’t worry about it because you don’t read them – ha ha,” Romney said at a Tax Day Tea Summit, hosted by the Independence Hall Tea Party Association. Acknowledging the unrelenting news cycle of his second White House run, Romney signaled his campaign was transitioning from primary election mode facing GOP opponents to the general election against his sole Democratic opponent President Barack Obama. “This campaign is just getting going. It’s going to be fun,” he told hundreds gathered at the Franklin Institute on Tuesday night. Romney spoke out against one of Obama's signature economic initiatives, known as The Buffett Rule, which would have required anyone earning more than $1 million to pay a minimum tax rate of 30%. "His big idea now is this Buffet Rule, which is – someone calculated by the way, that the taxes he would raise from his Buffet Rule would pay for 11 hours – would pay for 11 hours of the government, alright? This is not exactly a grand idea. 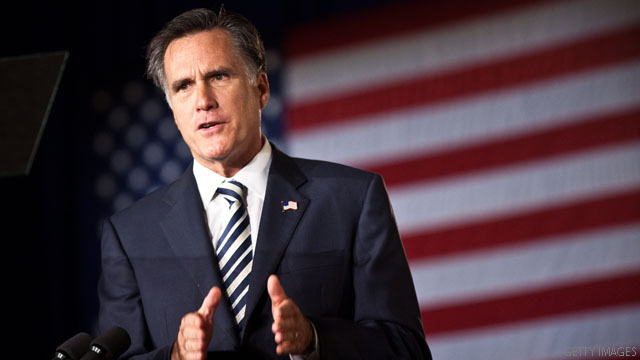 This is a man who is out of ideas, he's out of excuses and in 2012 we're going to make sure he gets put out of office," Romney said as the audience stood up and chanted his first name. He did not acknowledge the news from Capitol Hill, which occurred less than an hour before he appeared in Philadelphia, where Senate Republicans blocked the measure from receiving the 60 votes necessary to allow the Senate to open debate. With 10 months of campaigning behind him, Romney remained optimistic despite a tough slog ahead. "I had not expected to have the great privilege of doing this and I find myself having the time of my life,” he said. I think I read that the Buffett rule would amount to about 5 billion in taxes a year extra. I guess that's about enough to pay for a GSA Conference! I hope your ready mitten, we all know how bunkers you get when your about to end up with short stick. We know you will lie lie, spin spin, and get grouchy as heck if you lose. I hope you'll be a good sport if this should happen. It is so fitting to see our Mormon star Mitt Romney near the statue of Ben Franklin. It is not always well known, but Ben Franklin attended many different church services of many faiths, so it is clear that he would have accepted a Mormon as president. That fake "ha ha ha ha ha" of his will do him in. He isn't funny (though he laughs at all the peons when he tries to make us think he is). Like Mitt Romney, Ben Franklin spent considerable time in France. He understood exactly how important it was for the colonies to be well funded and he appealed to the French. Ben Franklin was a pragmatist. Ben Franklin would have understood Mitt Romney. He would see that we Americans must sacrifice and we must do it now, for the sake our future. This is in our blood. The blessed Latter Day Saints faced times of great hardship. Much sacrifice was needed. Mitt Romney will be a wonderful president. He comes from a long line of pure people with good intentions. Evangelicals and Mormons must unite and see our common ground.